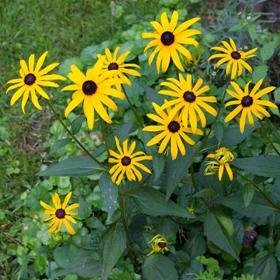 ‘Goldsturm’ is an old garden standard and by far the most popular cultivar of Rudbeckia fulgida. Its large flowers consisting of brassy orange-yellow rays surrounding nearly black cones are what make this plant so sought after. This late-season perennial daisy complements ornamental grasses well and is tough enough to hold its own in prairie planting schemes. ‘Goldsturm’ can be propagated by division, however, if left undisturbed it will slowly spread into a pleasant tall groundcover. As a compact cultivar ‘Goldsturm’ does not need staking and in addition to being a great choice for mass plantings it also provides excellent cut-flowers. It thrives in a wide range of climatic zones and succeeds in almost any soil and situation from semi-shade to full sun.